HELLO!! 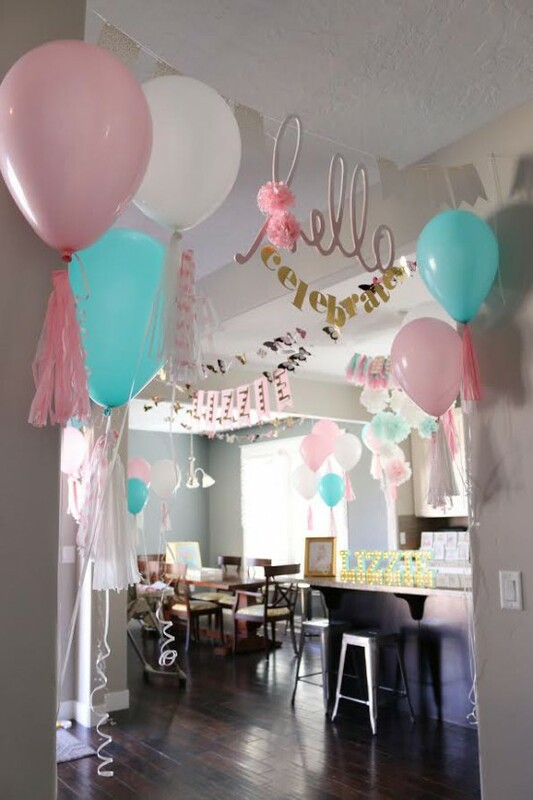 My name is Heidi Swapp, and I am SO excited to share some fun and SUPER easy ideas for making ANY party absolutely gorgeous and unforgettable! 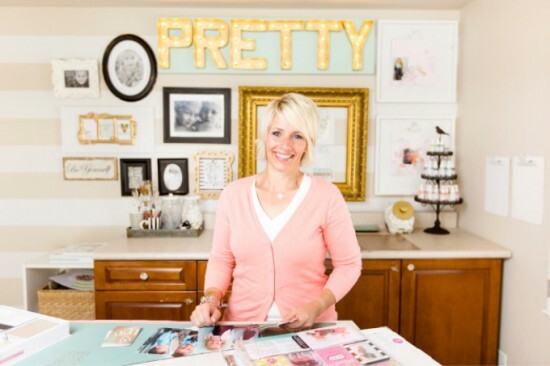 I am a “memory keeper” at heart… my first love, when it comes to crafting, is actually SCRAPBOOKING! 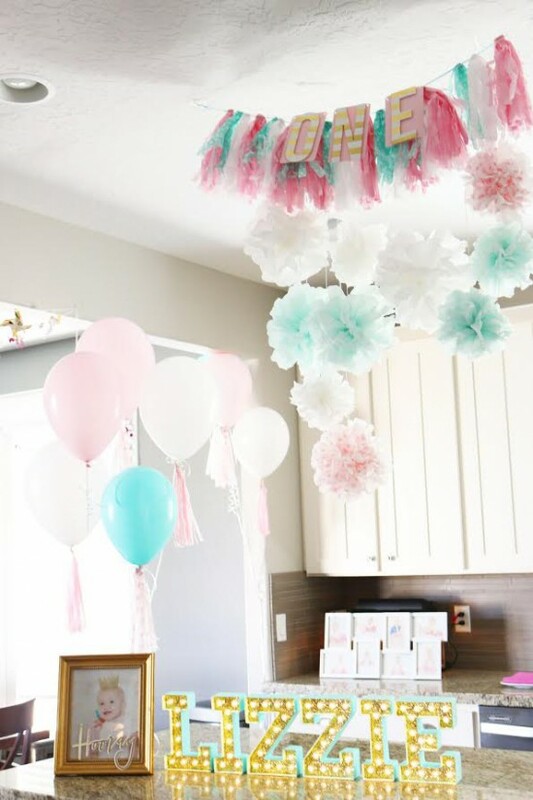 But along the way, I have always loved to create elaborate and beautiful party décor that would make that birthday girl or boy feel extra special and LOVED! (doesn’t hurt in the photo department either!) 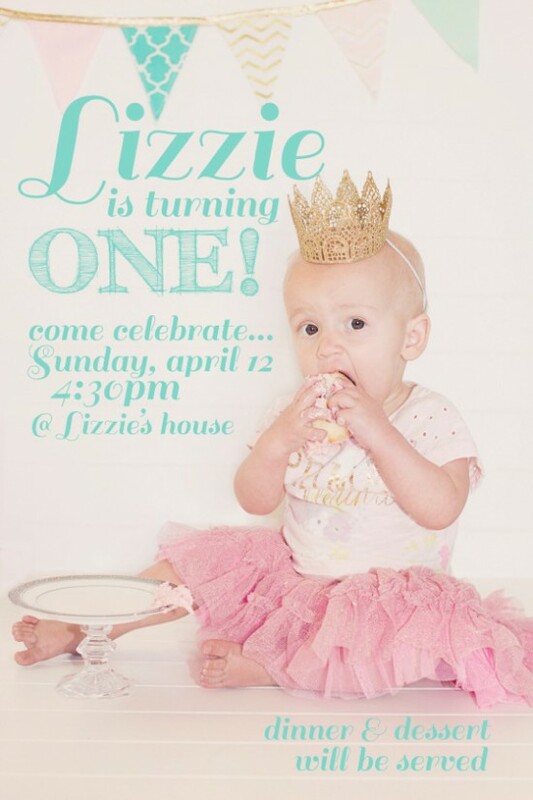 SO, my sweet little niece… the very last one… our family caboose was turning ONE, so I just HAD to convince my sister to let me create some fun decorations to celebrate! This is Eliza… we call her “lizzie”. She is just yummy cuteness, and we all just love her! My sister had always wanted to have “smash cake” photos taken of her kids, but didn’t until this very last baby! 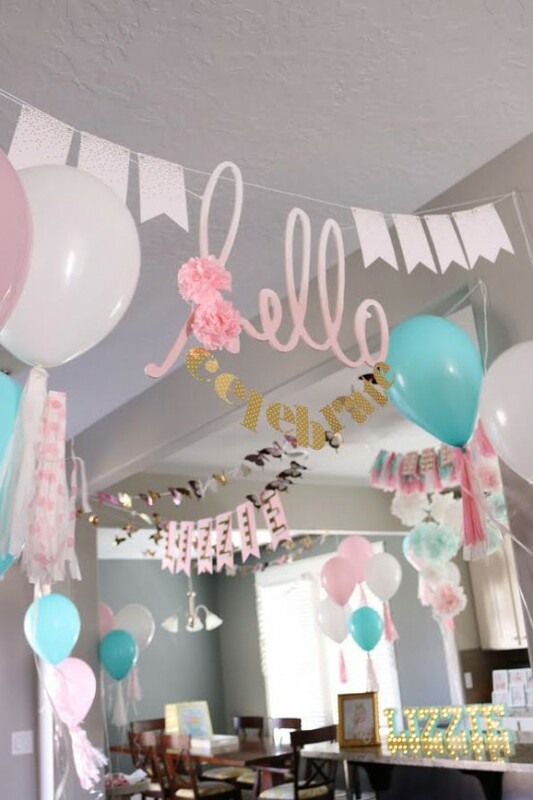 The photos turned out SO CUTE that she used them for the invitation for her party, and I used it for inspiration for the décor! I turned to my new Minc foil application machine to create gorgeous ONE-of-a-KIND elements to transform my sister’s kitchen into a party! 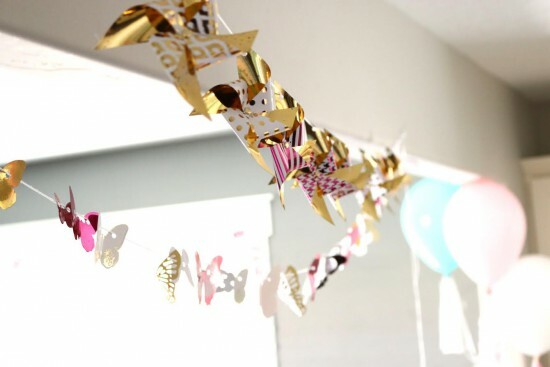 No party is complete without fun and happy banners strung all over! It’s my favorite go-to party accessory! They are super easy to craft, but make a HUGE statement! Here’s a shot of what it all looked like together! The first thing I made was a little word banner using the “polk-a-dot alphabet” set. 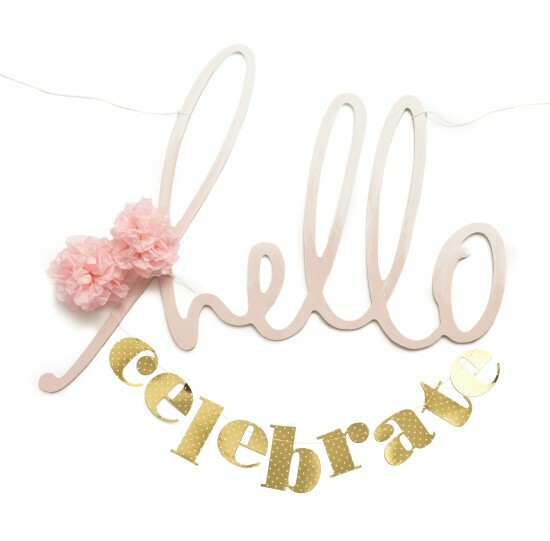 I added gold foil to the word “celebrate” and used my sewing machine to create a mini-banner. I then tied it to a larger wooden word “hello”. I thought this would be a great banner to welcome guests to the party! I used crocheting string to hang the words with command strips. If you look closely in the photo, I also added another set of banners on either side of the “hello” word, also foiled in gold. These come in the “ Mini Banner” set. These have holes already punched, and they can be used over and over again, party after party… always just adding another layer of décor! 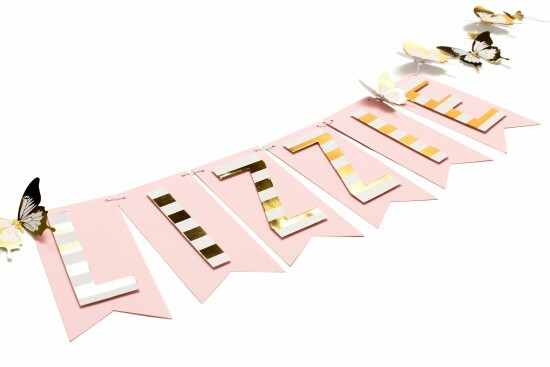 Next I wanted a personalized banner to spell out her name “LIZZIE”. I used the “Minc Jumbo Alphabet” and added gold foil to each letter. I then cut 4”x 7” pennants from light pink Bazzill Cardstock, and punched 2 holes at the top of each one. I used foam adhesive to add the letters to each pennant, which gave just the dimension! To just make it a little more girlie, I also added a couple of my FAVORITE elements in the whole Minc line: the “Minc 3D Butterflies”. I love how cute they are strung right on the ends of the garland! 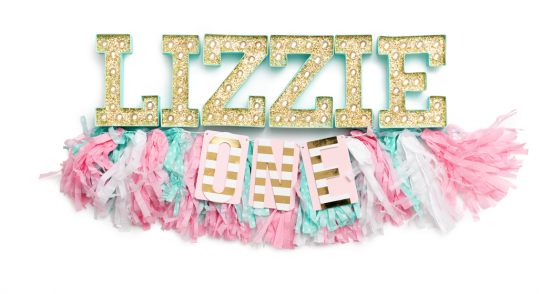 I also layered the same type of letter treatment, this time spelling out the word “ONE” over a tissue paper tassel garland. The gold foil just popped against the soft tissue tassels! And since I am obsessed with the butterflies, I just kept right on foiling them! 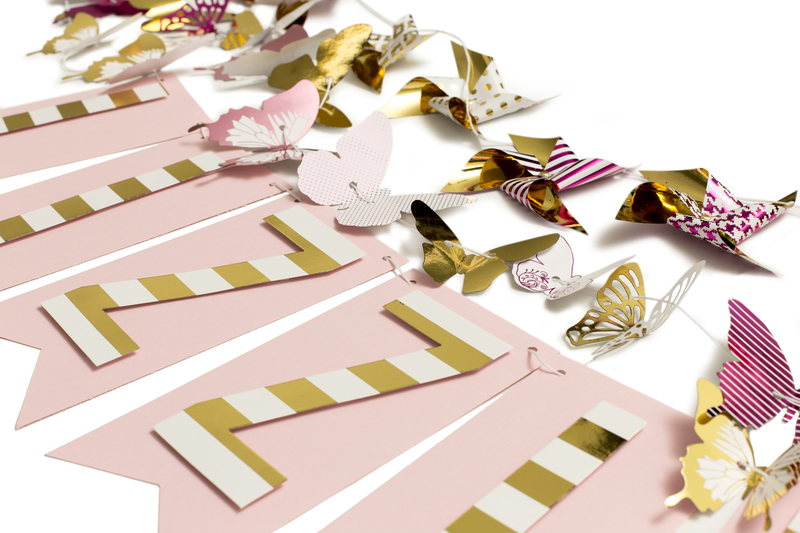 I combined light pink, dark pink and gold foil on the entire package of 72 butterflies! They come in sheets, already die cut so it’s really quick and easy to add foil. I then quickly punched holes in each butterfly and threaded them onto the string to make such a cute garland. 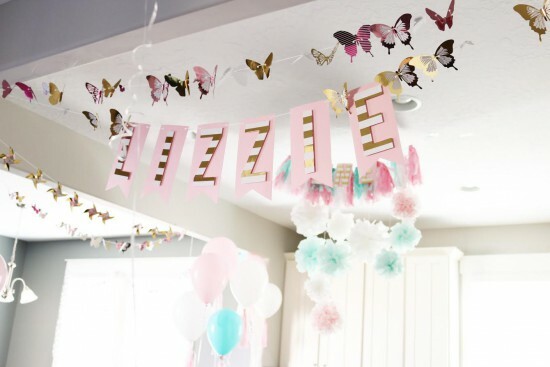 I created 2 different strings of butterflies and layered them over the “lizzie” banner as well… I loved the layers and dimension it created! 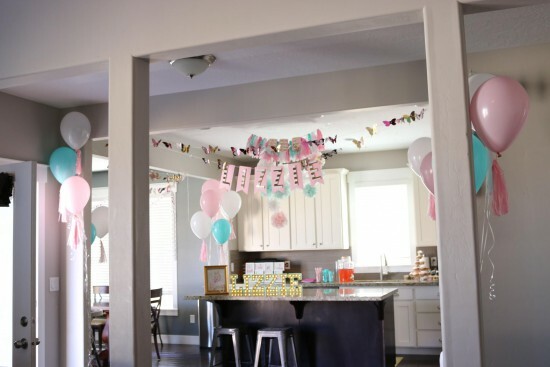 Another fun and unique way to use the “Minc Pinwheels” was as a garland instead of on a stick! Turned out super cute… I used the same color combo, and added foil to both the front and back of the pinwheels. Instructions and brads are included in the package so it’s really simple to put them together. Once they were all assembled, I punched a hole in each one and threaded them onto a long string! I love how they all looked together! 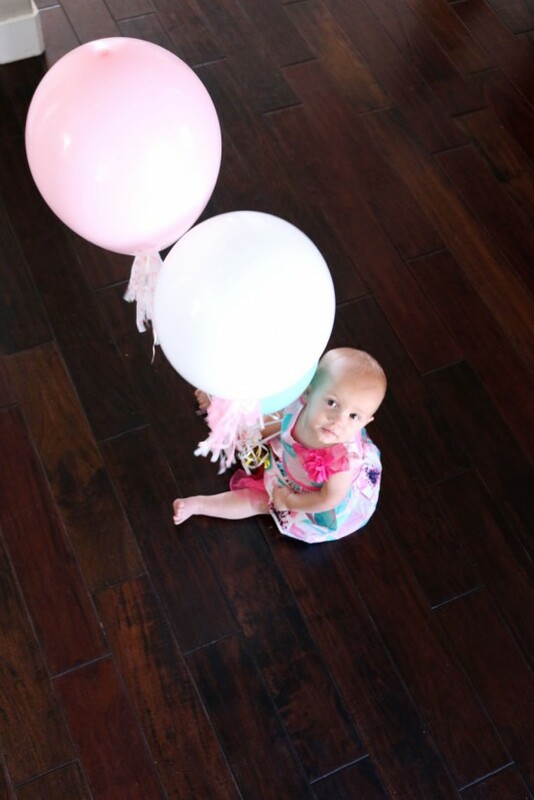 I added a few balloons, and of course some tissue paper puffs…they just make everything look super festive and happy! Of course the finishing touch of the Marquee Love letters was not to be underestimated! 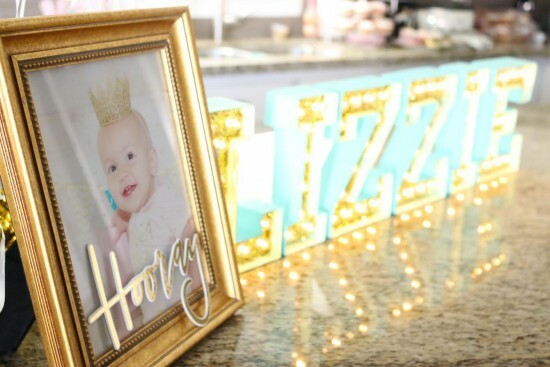 A little paint and gold glitter makes these lights absolute show stoppers! 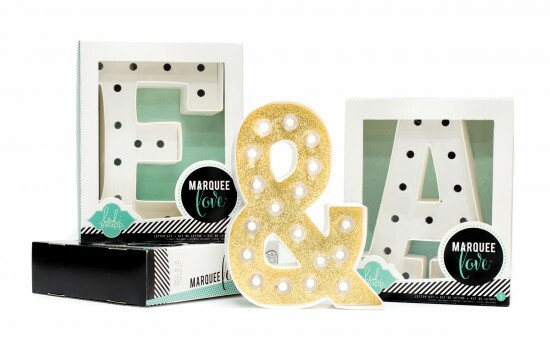 These marquee-style DIY lighted letters are coming SOON to JOANN Fabric and Craft Stores! 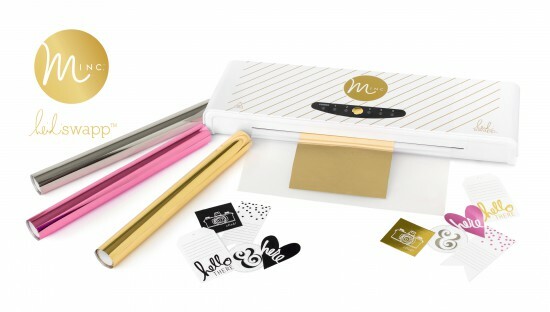 The Minc Machine makes it SO easy to add dramatic and spectacular foil touches to ALL your party décor! You can even use a Laser Printer to create your own additions and add foil to those as well! With the Minc, sky’s the limit! Create fun gift tags, goodie bags, invitations and even thank yous! It’s such a fabulous way to make any party totally personal and completely memorable!